Heyyyyy lookie here! 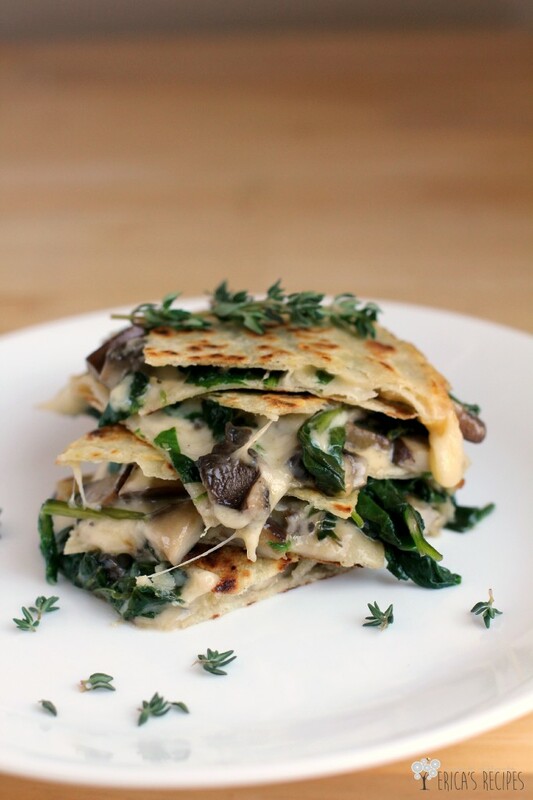 I did ‘fusion’ with this fun and hip Spinach, Mushroom, and Thyme Quesadillas with Smoked Gouda. YUM! If you don’t know what I mean, fusion is combining different cuisines – in this case, a kinda-sorta French filling in definitively Mexican packaging. …And this was absolutely UH-MAY-ZING. Soooo tasty. This combo of smokey Gouda cheese, beefy mushrooms, and the hint of herby thyme, all in a crispy quesadilla is outstanding! 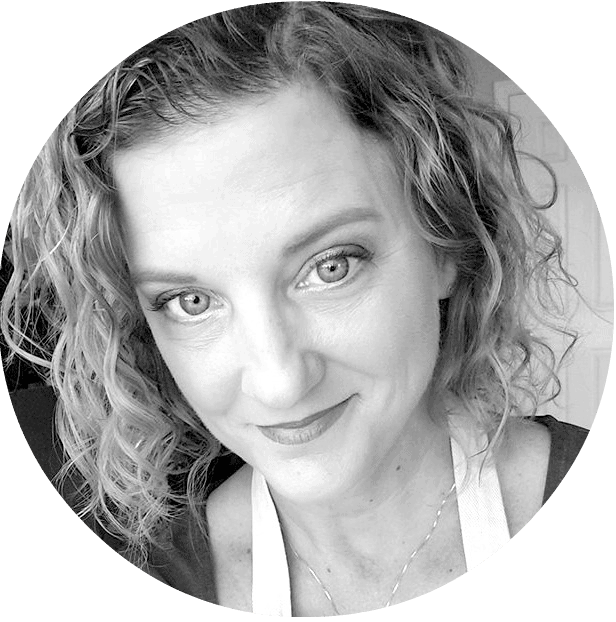 IMO (see, an urban acronym – I’m hip! ), corn tortillas actually make the best quesadillas. I absolutely love the toasty flavor corn tortillas get, and it magically happens with just a little cooking spray. So if you haven’t tried them, please do …you will not regret it. I’m sitting here typing this, picking spinach out of my teeth cuz I just ate this Spinach, Mushroom, and Thyme Quesadillas with Smoked Gouda awesomeness and I can’t get over how good these flavors are! To prep the mushrooms, turn the caps over and, using a spoon, gently scrape off the dark gills on the underside. Dice in a 1/2-in dice. 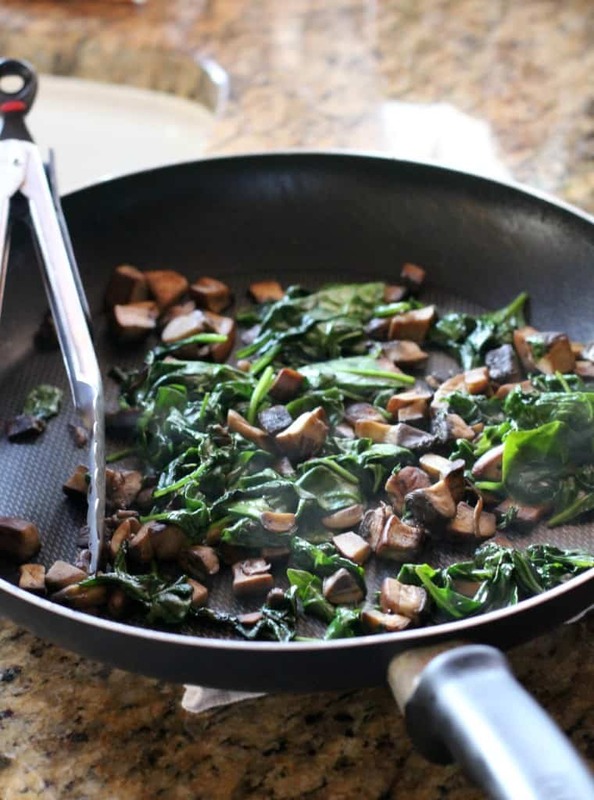 In a large, nonstick pan, heat the olive oil on high heat. Add the diced mushrooms and saute, tossing occasionally, until browned. Add the spinach and thyme and cook for a minute, stirring regularly, until spinach is nice and wilty. Remove from the heat. Season with kosher salt and pepper. Heat another large, nonstick pan on medium-high heat. On a large cutting board, lay out 3 tortillas. 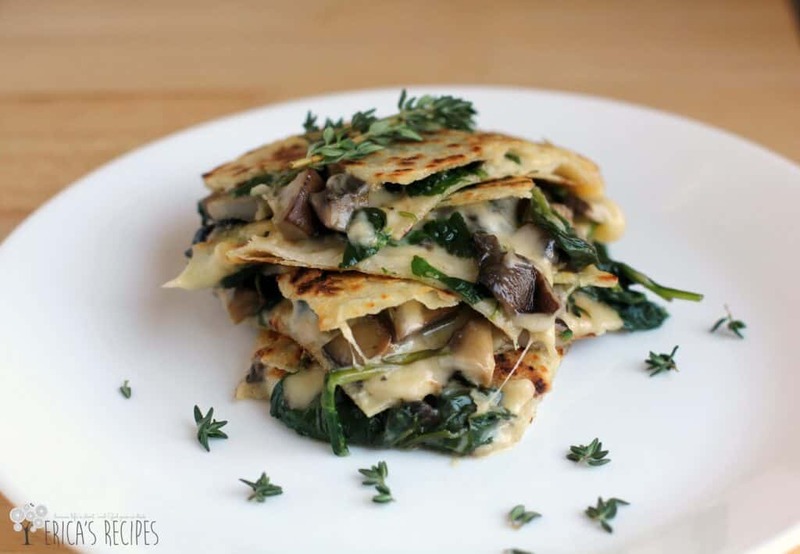 Top each with a slice of cheese, then the mushroom-spinach mixture, then another slice of cheese. Top each with a tortilla. Spray the heated pan with cooking spray. Carefully transfer the assembled quesadilla to the pan. Spray the top tortillas with cooking spray. Cook the quesadillas until nice and toasty on the underside, then carefully flip to toast the other side. Yield: 3 servings. I love this combination! Yummers!! Love this combination, great presentation!!! Wow, this looks restaurant quality. Such a pretty presentation. Looks delicious! We usually eat chicken and cheese quesadillas. This would be a nice change. The presentation is amazing and quesadillas are always winners. This one is really original and looks divine! Hi. I’m visiting from Treasure Box Tuesday. I have this odd love of spinach so I knew I had to see what these quesadillas were all about. I’ve decided that they are all about awesomeness. Pinning because I need them in my life!